You’ve just signed up, have a project to run and probably wondering where to start. 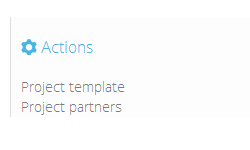 Let us give you a few hints on how to transfer your project details to AdminProject and make it ready to launch. After your first login you’ll be taken to a welcome screen and invited to take a short orientation course on the user interface. 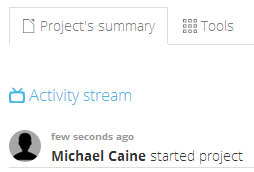 When done, you may click on My projects link on the right sidebar. The main work area is empty (unless you have been invited to participate in somebody else’s project) so the first thing you should do is Create a new project. Choose an easily identifiable name and click create. Generally, the right sidebar is the place to look at when you want to create a new item or add something to the currently displayed one. Your project space is ready. You may need to fill in several details you deem necessary. Go to Settings tab in the project’s main view and select start and end dates, choose its colour ID and invite people who also work on this project. They will appear on the list after they have successfully followed the instructions in the invitation e-mail. You can assign administrator’s role to someone already in the project. In this section you can also upload your document template in .docx format, which will be used as a base for all documents generated by AdminProject. And a graphic footer for your project space which will be displayed at the bottom of each project page. Here you should add project partners who are later necessary in financial and dissemination modules when you need to assign expenses or activities to a partner. Give them a number (like P0, P1) they have in your project, put in their name and assign an acronym which will be used throughout the project. Scroll down and assign each user to a partner. The project is ready, the users are here, the partners are defined. Now it’s time to set up work packages. When working with EU-funded projects, you have come across the concept of a work package. AdminProject has them as well. Work packages are located under Tools tab. The list there is empty, so click Create a new work package look at the right sidebar. The names of work packages are sometimes very long so use the Acronym field to use a short name in other modules. 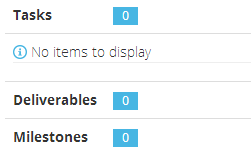 After filling and saving the details, you will see where tasks associated with the work package will be displayed alongside the deliverables and milestones. You can add the latter through links on the right sidebar and the former by going to Tools > Tasks.